[He] was the most sociable of the pups we’ve raised, by far. He was a total love sponge, climbing into our laps for a hug, often while wubbing on his favorite stuffed teddy bear. He absolutely loved to carry things: shoes, keys, lunch bag, mail, water bottle . . . anything. Every morning he pranced into the lobby at work with something in his mouth and paraded around the room so everyone could ooh and aah at his cleverness. What do you think? Does this remind you of a certain goober dog? The passages above are not about Micron, but easily could be. Proving nature over nurture in this particular fer instance, the words above are about his littermate Mars. You know what I like so much about this volunteer puppy gig with Canine Companions for Independence? Oh sure, there’s that thing about satisfying the craving for puppy breath and Frito feet. That’s a given, right? What I didn’t expect when I signed up was how much bigger my world would become. And I remain wondersmacked by it all. Over the past four years I’ve managed to finagle my meager existence into a great realm filled with dog lovers and volunteers passionate about their work. So much so, that when I come across someone who doesn’t understand/appreciate/like dogs, it comes as a surprise. I have to actually process that thought. And I try not to judge these folk harshly. I really do. But outside of having a bad experience with an aggressive dog, I just don’t get these people. Not liking dogs feels like a character flaw. It’s remarkable, really, how saturated my world is with dog hair. Home, family, friends, volunteer work and even my job are all things Dog. Livin’ the dream, I am. And the people we’ve met on this journey! Holy cow, I just never saw this coming. I began an online correspondence with Marianne McKiernan when we were charged with raising our M litter puppies, Micron and Mars. And things grew from there. Being bloggers, the both of us had yet another thing to bond over. And now, a few dogs later, our friendship is still clicking along. While I’ve known all along Marianne is a producer for KMGH-TV, I was just a little embarrassed to find out recently she is indeed a two-time Emmy award winning producer. I was completely unaware of that factoid until this month and have now promised to treat her with some decorum by referring to her as awesome instead awesomesauce. And like that isn’t enough, her book Let the Dogs Speak was released this month. So while we’re on the topic of awesomeness, I am completely jazzed to have the bragging rights to tell Everyone that I’m friends with a Published Author, y’all. A two-time Emmy award winning producer author, don’t you know. Right here in my humble little world. How cool is that? I’ll tell you exactly how cool. 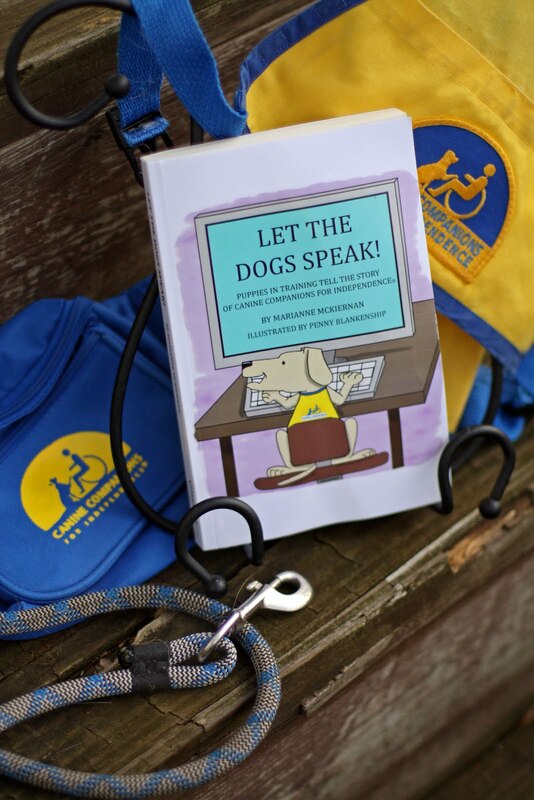 Offered in a remarkably affordable paperback version, as well as for the Kindle and Nook, Let the Dogs Speak is an entertaining collection of adventures as seen from a CCI puppy’s point of view. (All of the author’s royalties will be donated to CCI). Of course, I highly recommend the tome to lovers of all things Dog. But hey, don’t take my word for it. Not when we have raving reviews by working dogs to support my hefty claim. Dogs don’t lie. They don’t know how, you know. You trust Micron, don’t you? If you’ve been following him here on the dog blog, you’ve surely gotten to know the yeller fellow over the last three years. He indeed has (is a?) character and, work ethic issues notwithstanding, he is surely a dog that can be held to his word. And what is the word of Micron, you ask? Well, I tell you he speaks from the heart. Or the stomach. Some major and necessary juicy organ, anyway. His words are true. Right. 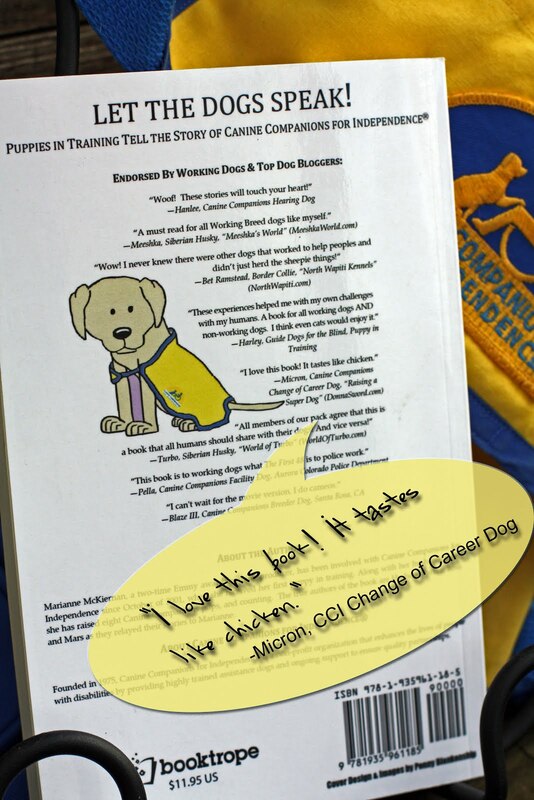 So we can also turn to the blurbs as written by other more deep thinking canines, such as Hanlee (CCI Hearing Dog) and Harley (Guide Dogs for the Blind). Their words come from their own juicy organs, most likely brains in this case. Some cute, cute, cute illustrations by Penny Blankenship will keep you flipping through the pages, too. And check out the teaser at the Let the Dogs Speak fan page on Facebook to keep an eye out for a contest to win signed color copies of her artwork. I. Must. Have. One. The stories as told by Mars, Micron’s M littermate, start on page 170. See if anything sounds familiar there [coughmicron] in gooberness personality traits. And I have to tell you this. I must. Something else in the Mars section, starting on page 213, just might bring up a nagging feeling déjá vu-ishness if you’ve been with us on Raising a Super Dog for a while. [ridiculously happy grin]. Holy cow, but I love my CCI world. It just gets more awesomesaucy all the time. Isn't it amazing how loving dogs can introduce you to so many great friends? You're very welcome. It's pretty darn exciting to see Marianne get her words out there in a book for all to hold in their hands. And to get her very own ISBN number, which is a great bucket list item if she had it on there. Your clever illustrations just brings the book together, IMHO and all. Hi Pamela, yeah it is pretty amazing how these creatures bring us together. Our social bridges. When out with the pups in training, I've had conversations with some very interesting folk. We would have just passed by each other without much thought if the pup hadn't been there. Hope you enjoy the book. Marianne has compiled some great stories of her pups. Thanks for that fantastic phrases concerning the guide, as well as my personal pictures. You have simply additional another buddy for your listing of canine individuals. Is not this the swirly globe associated with hair protected amazing benefits.